Gout is the commonest inflammatory arthritis affecting around 1.4% of adults in Europe. It is predominantly managed in primary care and classically affects the joints of the foot, particularly the first metatarsophalangeal joint. Gout related factors (including disease characteristics and treatment) as well as comorbid chronic disease are associated with poor Health Related Quality of Life (HRQOL) yet to date there is limited evidence concerning gout in a community setting. Existing epidemiological studies are limited by their cross-sectional design, selection of secondary care patients with atypical disease and the use of generic tools to measure HRQOL. This 3 year primary care-based prospective observational cohort study will describe the spectrum of HRQOL in community dwelling patients with gout, associated factors, predictors of poor outcome, and prevalence and incidence of foot problems in gout patients. Adults aged ≥ 18 years diagnosed with gout or prescribed colchicine or allopurinol in the preceding 2 years will be identified through Read codes and mailed a series of self-completion postal questionnaires over a 3-year period. Consenting participants will have their general practice medical records reviewed. This is the first prospective cohort study of HRQOL in patients with gout in primary care in the UK. The combination of survey data and medical record review will allow an in-depth understanding of factors that are associated with and lead to poor HRQOL and foot problems in gout. Identification of these factors will improve the management of this prevalent, yet under-treated, condition in primary care. Gout is the most prevalent inflammatory arthropathy, affecting around 1.4% of the adult population in the UK. It is caused by monosodium urate (MSU) crystal deposition in and around joints once the physiological saturation threshold in body tissues for uric acid is exceeded. The most commonly affected joints are the first metatarsophalangeal joint (1st MTPJ), mid foot and ankle. The first acute attack affects the 1st MTPJ in 56-78% of the patients with 90% having acute gout of the great toe at some point in their disease course yet chronic foot problems are also common in people with gout. Hallux valgus deformity and chronic pain in the great toe are more common in people with gout than age and gender-matched controls. A small hospital-based study has shown more frequent gait impairment and foot-related functional problems in patients with gout than in those without. There is little evidence from a primary care perspective about the potential long-term consequences of gout for the foot. Gout also has an adverse impact on patients’ health related quality of life (HRQOL)[5, 6] and emotional, social and physical functioning, resulting in significant disability. Factors directly related to gout symptoms such as frequency and severity of acute attacks as well as those related to disease complications and adverse effects of gout treatment, all potentially contribute to impaired HRQOL. Cross-sectional epidemiological studies in primary care have shown that gout has an independent association with impaired HRQOL, particularly affecting the physical domain, after adjustments for co-morbidities such as osteoarthritis, renal and cardiovascular disease[6, 7]. ‘Treatment failure’ gout within a hospital-based cohort has also been found to have a significant impact on patient HRQOL and disability, especially in the realm of physical functioning. The same cohort study demonstrated that the patients’ perception of disease severity correlated more closely with HRQOL than the physicians’ assessment of disease severity. Patients and healthcare providers often have different perspectives of what constitutes optimal management of gout. Whilst physicians regard pharmacological treatment of gout to be effective, most patients discontinued treatment due to adverse or no positive effects, treatment-induced flares and financial constraints. A recent qualitative study on the impact of gout highlighted the lack of understanding and the stigma associated with this condition which often leads to under-reporting of symptoms. This in turn can lead to suboptimal treatment despite disease severity. These findings are not surprising given that, until recently, there has been little published work on the implications of gout in terms of morbidity and mortality as well as associated healthcare utilisation and costs. The majority of gout is managed within the primary care setting, yet most of the research to date has taken place in secondary care which may deal with more complex and atypical presentations including those who have failed to respond to or not tolerated standard therapies. Therefore the applicability of such data is questionable in the wider community setting. Existing epidemiological studies have had limitations such as small sample size, cross-sectional design and the use of generic rather than disease-specific instruments such as the Gout Impact Scale (GIS) to measure HRQOL. Little is known about the changes in HRQOL in gout patients due to the lack of longitudinal follow-up. To describe the spectrum of HRQOL in patients with gout and its distribution by demographic, socio-economic and anthropometric characteristics. To describe the prevalence, onset, persistence and progression of chronic foot problems in gout over 3 years. Cross-sectional associations between poor HRQOL and gout disease characteristics and treatment, chronic foot problems, co-morbidities, and psychosocial factors in gout. Change in HRQOL in gout over 3 years and determine which of the associated factors may predict deterioration or recovery. A primary care-based prospective cohort study with linked medical record review. All phases of the study have been approved by the North West-Liverpool East Research Ethics Committee (Reference number 12/NW/0297). Registered with 30 general practices in the West Midlands, UK. Read code consultation for gout or a prescription for colchicine or allopurinol during the preceding two years. Under 18 years of age. Vulnerable groups – e.g. significant cognitive impairment, severe enduring mental illness, active malignancy or other terminal illness. Those who are unable to complete the questionnaires in English. The different phases of the study are illustrated in Figure1. Staff from the West Midlands North Primary Care Research (WMN PCR) will conduct a single electronic search of the primary care records in participating practices to identify patients with Read codes for a consultation for gout or a prescription for colchicine or allopurinol within the last two years. The Read codes used by the Arthritis Research UK Primary Care Centre (ARUKPCC) to define gout are listed in Table1. The WMN PCR team members will screen the mailing lists (prior to mailing) for patient deaths and departures from the practice to ensure that patients are not inappropriately contacted. The lead general practitioner (GP) at each practice will be invited to identify potentially vulnerable patients to be excluded. All eligible patients will be sent a study pack from their GP containing a letter of invitation, participant information sheet (PIS), a pre-paid return envelope and a baseline self-completion questionnaire which will also include a consent form asking for consent for further contact and review of their medical records. Potential participants will be provided with a contact name and telephone number should they have any queries about the study. Patients will be informed that they are under no obligation to participate and that if they decline their normal clinical care will not be affected in any way. Participants will be asked to return completed questionnaires, and upon receipt by the research centre, the response will be recorded against a unique patient number in a mailing database. After two weeks, those who have not responded will be sent a reminder postcard from their GP. After a further two weeks, a reminder letter with repeat baseline questionnaire will be sent to those who have yet to respond (4 weeks after the first questionnaire). Those who fail to respond after all three baseline mailings will be assumed not to have consented to the study and will not be contacted again. The impact of gout on daily life. General health (including co-morbidities and measures of physical function). Measures of anxiety and depression. Foot and other joint problems. Details of the conceptual domains, operational definitions and empirical measures are provided in Table2. The completed baseline questionnaires will have the responses securely stored in the study database. A specific study database will be created to record responses to the questions. Data entry will be performed by dedicated trained members of the administrative team as the completed questionnaires are returned. Although they are experienced in data entry, specific training will be provided for this study. The principal investigator (PI) and study statistician will determine coding prior to data entry into the database which will provide coding options. One in ten random questionnaires will be checked by a member of the study team for the purposes of quality assurance. This information is kept by the research support co-ordinator. Only relevant members of the research team will have access to the database which is password protected. Requests for access to the data stored in this database must be made in writing, along with an analysis plan, to the Chief Investigator (CI). Questionnaires and consent sheets are securely stored in separate locations to protect patient confidentiality. All participants in Phase 1 who give permission for their GP records to be accessed will have their computerised medical records tagged by a member of the WMN PCR team. The practices participating in this study are fully computerised and undergo annual audits completed by the WMN PCR team to assess the quality and completeness of the data at the practices. All consultations for the 2 years prior to study entry and then prospectively for the three-year study period will be identified. The data obtained will include co-morbidities, repeat consultations for gout, prescription patterns and referral to secondary care. All patient identifiable data (name, contact details) will be removed from the medical records and the consultation data will be linked to the survey data by unique survey identifier. Follow-up surveys will be mailed at 6, 12, 24 and 36 months to all participants in phase 1 who consented to further contact. The focus of follow-up will be clinical (pain/disability severity) change and the possible determinants of this. The questionnaire will include repeated measures of general health (including generic measures of physical function), psychosocial factors, co-morbidity and gout symptoms. Non-responders to the questionnaire will be sent a reminder postcard after two weeks. Those who do not respond to the reminder postcard will be sent a repeat questionnaire, PIS and a further covering letter four weeks after the initial mailing. The WMN PCR team members will screen the mailing lists (prior to mailing) for patient deaths and departures from the practice to ensure that patients are not inappropriately contacted. Disease specific HRQOL scores will be recorded using the Gout Impact Scale at baseline, 6, 12, 24 and 36 months. In order to use the information recorded at all five points, a sample size of 882 would allow a smallest meaningful difference in HRQOL of 0.2 standard deviation units to be detected between two groups (441 subjects per group) defined in terms of frequency of gout attacks (<2 attacks, ≥2 attacks per year) using a linear mixed model (significance 0.05, power 90%, autocorrelation 0.8). Allowing for 70% response at baseline and 30% drop out over the follow-up period would require 1800 people with gout to be contacted at baseline. Descriptive statistics will be used to assess response bias, along with the characteristics of the baseline population. Factors associated with levels of HRQOL at baseline will be assessed using students’ t-tests chi-squared tests, and logistic regression, as appropriate. Descriptive statistics will be used to assess attrition bias and to describe the onset, and persistence of foot problems and their characteristics. Regression models will be used to assess the factors predicting poor HRQOL and chronic foot problems prospectively over three years. Imputation techniques will be used to account for missing data and loss to follow up, as appropriate. HRQOL is an important yet under-researched outcome measure in chronic gout. To our knowledge this is the first prospective observational cohort of gout patients in primary care in the UK which uses generic as well as gout-specific questionnaires to assess HRQOL. 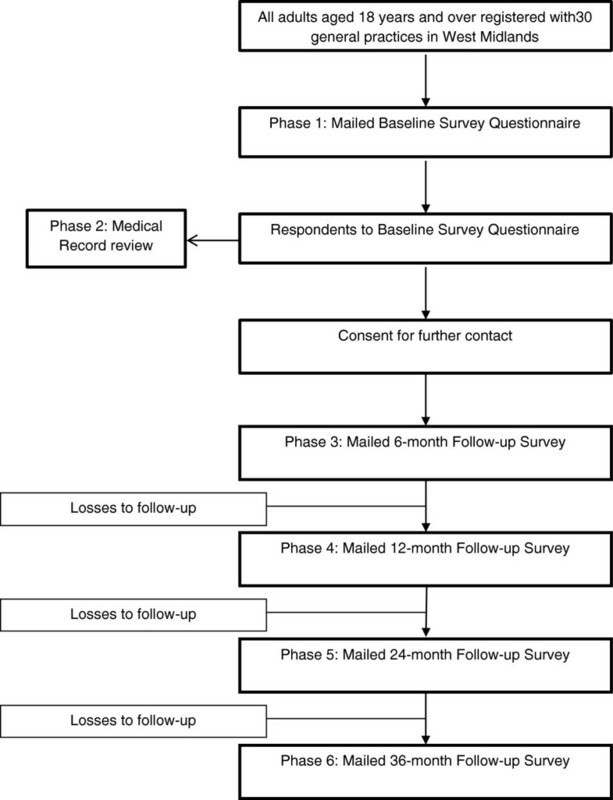 Through follow-up surveys and medical record review, the study investigates the occurrence and frequency of poor HRQOL, factors associated with it at baseline and predictors of poor outcome at follow-up. A limitation of the study is the identification of patients based on a clinical diagnosis of gout (the gold standard of urate crystal identification in synovial aspirate is not mandatory for inclusion into the study). However, a clinical diagnosis based on the rapid onset of pain, erythema and swelling affecting the 1st MTPJ in the context of hyperuricaemia is supported by the European League Against Rheumatism (EULAR) recommendations for the diagnosis of gout. Potential participants will be identified either by a gout-coded primary care consultation or a prescription for allopurinol or colchicine in the study period. Other urate lowering therapies such as febuxostat and uricosuric drugs will not be included in this search strategy as both are infrequently used in UK primary care. Patients taking either drug will be identified by regular consultations. This study ultimately aims to improve the management of gout in primary care through identifying and considering factors associated with and predictive of poor outcome in a patient-centred treatment plan. PC and SM are supported by NIHR National School for Primary Care Research fellowships. CM is funded by an Arthritis Research UK Clinician Scientist Award. This research is funded by the ARUKPCC, Keele University and service support through the West Midlands North Comprehensive Local Research Network (CLRN). The funders have had no role in the study design, data collection or analysis, writing the manuscript or its submission. The authors would like to thank the PCR team and administrative staff at the ARUKPCC. ER and CM conceived the study. All authors participated in the study design. PC, CM and ER drafted the manuscript which was approved by all authors.